Sidewalks are very important for safety of friends and family as well as adding a beautiful look to your home. 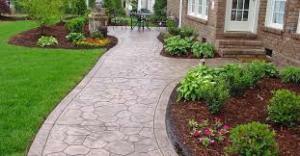 In area like Manhattan & Queens NYC for example a safe and beautiful sidewalk can really create a welcoming look for your home.we specialize in all types of sidewalks and walkways shapes and sizes, pavements, bricks, stones; we work with the best Eco friendly materials to achieve your satisfaction. Adding colors, different shapes and patterns make a huge impact on your sidewalks and walkways. Wait no longer and get an estimate today, we can promise you will never regret calling us! In addition residential general contracting services, we offer office buildouts, office space buildouts and renovations, commercial, hotel, and retail store contracting and construction projects. We are licensed and insured NYC retail contractors, NYC commercial contractors, and NYC hotel contractors. When ever you need to remodel or repair your current sidewalk/walkway or create a new one we will exceed your expectations for the typical sidewalk/walkway, we create not only great designs but also the material quality and detailed work take our sidewalk and walkway construction to a whole new level, five stars hotels are no longer the only ones with a great panoramic view, you too can have a wow” looking home.